The recent wave of violence between Israel and Hamas, which to date has resulted in the death of more than 192 Palestinians and the injury of more than 1,100 as well as the injury of several Israelis, continues to escalate with no clear sign of when it might end, despite a ceasefire proposed by Egyptian President Abdel Fattah al-Sisi. The only thing that is fairly certain is how it will end. Both parties understand the decision between violence or ceasefire is primarily a function of credibility and how much pain they are willing to endure. When each feels it has re-established its credibility to a level it can live with, and the pain is becoming unacceptable, then a renewed truce will take hold. Few on either side have any illusions that they can deliver a devastating blow to the other that will change the uneasy truce that has prevailed–with some major interruptions–since Hamas took over control of Gaza from the Palestinian Authority (Fatah) in 2007. Current reports indicate that Israel accepted the ceasefire on July 15, but Hamas’s military wing hasn’t, so Israel is planning renewed attacks on Gaza, while additional rockets fell on Israel after the ceasefire was to take effect. There was no clear beginning to the current crisis. However, the drastic change in Hamas’s fortunes since its ally, former Egyptian President Mohammed Morsi, was overthrown by his military in July 2013, is a major factor. Hamas was quickly dropped as an ally by most regional governments, except Qatar and Turkey, and has since been scrambling to simply pay its employees and keep its government afloat. For its part, the Palestinian Authority (PA) and its president, Mahmoud Abbas, has also been floundering in the wake of the failure of the Kerry-inspired peace negotiations at the end of April. This pushed Fatah and Hamas into forming a long rumored “reconciliation” government, which Israel sees as a threat, even though it was made clear the new government would include “technocrats,” not Hamas officials, and would comply with the Quartet’s three conditions: recognition of Israel, renunciation of violence, and respect for previous agreements. On June 30, the boys’ bodies were found. It has since come to light that Israeli security forces knew with almost complete certainty that the boys had been killed immediately after their abduction, so in retrospect, the search was a transparent device to destroy Hamas’s West Bank infrastructure. Israeli journalist Shlomi Eldar reported in Al-Monitor on June 29 that the suspects were rogue Hamas members who acted seemingly without the knowledge, let alone acquiescence, of any of the Hamas leadership. For now, this seems to be the general consensus. Nevertheless, Israel has carried out numerous air attacks on Hamas installations in Gaza to “punish” it. The night after the boys’ bodies were found, a 16-year-old Palestinian boy, living in a middle class suburb of Jerusalem, was abducted and killed. The coroner’s report shows he was burned to death. Within two days, six Jewish teenagers were arrested by the Israeli police (three have since been released). No official details were forthcoming, but reports from various sources say that they are from the “religious” community (a very wide swath of society). Over the weekend, serious riots by Palestinians were reported in East Jerusalem and in a predominantly Palestinian area (Wadi Ara) in the north. In central Jerusalem, police protected Palestinians from Jewish mobs. The rioting was the worst in Israel since the beginning of the Second Intifada in October 2000, when thirteen Israeli Arab citizens were killed by police. Both sides are trying to prevent a repetition, and with the quick capture of the Jewish murder suspects, mob violence seems to be dying down, though verbal violence on both sides persists. However, military escalation has now made the stakes exponentially larger. Occasional rockets were fired at Israel from Gaza during this period and, as usual, Israel retaliated. These rockets are usually fired by the Islamic Jihad and the “Popular Resistance Committees,” which consider Hamas to be far too moderate, especially in recent months. However, following the July 6 air strikes on Gaza that killed six of its fighters (Israel denies having killed them, claiming their own explosives blew them up), Hamas began taking credit for rockets launched at southern and central Israel. Damage and casualties in Israel so far have been fairly minor; Israel’s Iron Dome missile defense has worked very well and intercepted most of the rockets headed for urban areas while most of the rest have struck in open fields. However, most areas of Israel have now heard warning sirens, and hundreds of thousands of Israelis have gone into shelters, at least briefly. 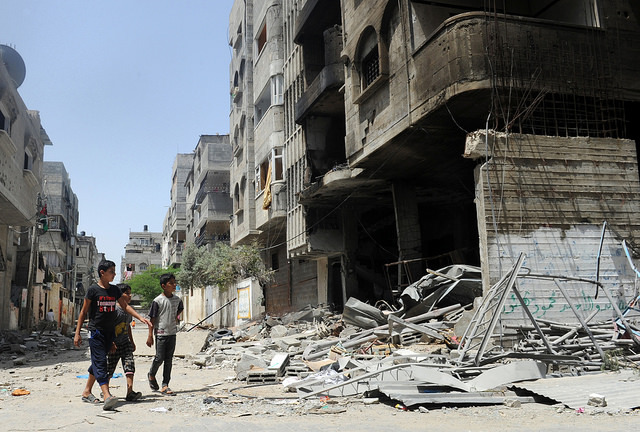 For its part, Israel has responded with massive air attacks on more than 1,300 targets. Israel is aiming to degrade Hamas’s military capacity; nevertheless, it seems clear that most casualties have been civilians. Israel has telephoned individual families warning them their houses are about to be targeted but not all of those warned have left in time, or some returned too early. Both sides are seeking a return to the status quo ante. Hamas is bitter because Israel has re-arrested dozens of those released in the 2011 Gilad Shalit prisoner swap, and claims Israel broke its agreement. It also demands that Israel allow Qatar to transfer $20 million to Hamas to pay outstanding salaries, and that Egypt and the PA agree to ease the conditions at the Rafah crossing, which is almost completely closed. Presumably, Hamas’s military wing is seeking something more than the previous status quo. Despite Israel’s vast military superiority, there is general, though not unanimous, agreement in the Israeli government that a ground invasion is highly undesirable, though Israel’s hawkish Foreign Minister, Avigdor Liberman, recently said Israel must conquer the entire Gaza strip, though this is probably more a political statement than a military likelihood. Nevertheless, Israel has authorized the mobilization of over 40,000 reserve troops to intimidate Hamas, demonstrate the government’s resolve to ordinary Israelis, and spur outside pressure on Hamas to stand down–and, of course, to carry out an incursion if necessary. Egypt’s President al-Sisi has stepped into his predecessors’ role of mediator, but his oft-expressed extreme distaste for Hamas limits his usefulness. The tragic irony is that although Hamas and Israel regard each other as existential enemies, both are quite willing to live with a ceasefire for the foreseeable future rather than make the compromises inherent in a permanent agreement. The lack of trust, however, makes the arrangement excessively vulnerable to any tremor. In this case, unfortunately, the actions of spoilers, whose goal was to disrupt the Hamas-Fatah reconciliation and renew Hamas’s zeal for fighting Israel, seem to be succeeding. Paul Scham is a scholar at the Middle East Institute (MEI) in Washington, DC and teaches Israel studies at the University of Maryland. A version of this article first appeared on MEI’s website on July 11, 2014.